Hyundai Motor unveils Tucson 2019. August. 22, 2018 07:20. bjk@donga.com. Hyundai Motor held a test ride event for the Tucson, a global bestselling sports utility vehicle (SUV) model, at Hyundai Motor Studio in Goyang, Gyeonggi Province on Friday. When asked why consumers should choose Tucson, a Hyundai official noted cost-effectiveness as a reason. The Hyundai Tucson 2019 has been given a facelift in three years. But it was more than a facelift. The new Tucson has had a major change in its engine, exterior design, and state-of-the-art functions, practically becoming a brand new model. The new Tucson is a compact SUV but looked nothing short of a midsize SUV. It had satisfying mobility and driving capabilities thanks in part to the same powertrain features as midsize SUVs. In addition, it is economical with the fuel consumption rate of 14.4 kilometers per liter. 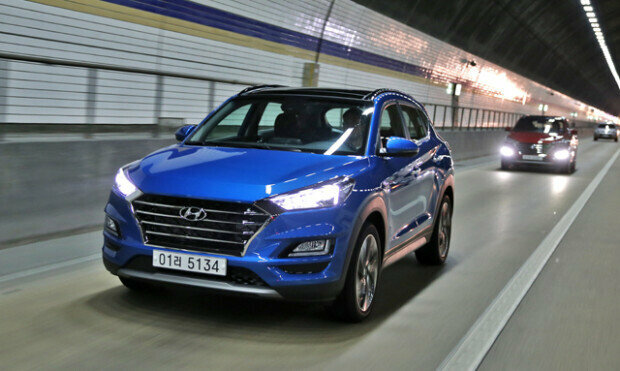 In particular, the upgraded Hyundai Tucson is the first Hyundai model to be equipped with the "SmartStream 1.6-liter diesel engine," a next-generation powertrain with better mileage and practicality and lower exhaust gas emission. The new model boasts a mileage of 16.3 kilometers per liter by employing upgraded mileage technology. One could experience the new Tucson’s partly automated driving function at the event. It added a new range of technology, including "Lane Keep Assist" function, which controls the steering wheel in case the vehicle departs the lane and stop-and-go-capable adaptive "Smart Cruise Control" function. What if a driver turns on the Lane Keep Assist and Smart Cruise Control functions at the same time in a traffic jam? The vehicle will automatically maintain the lane and distance with the vehicle ahead. Its "Home-to-car Service," which was first showcased at the Seoul Motor Show last year, enables drivers to remotely control the vehicle using AI speaker. At the event, a Hyundai official demonstrated how to use the Home-to-car Service. When he told the AI speaker to “Start the car,” the speaker said, “What temperature would you like it to be?” The car was started about 15 seconds after he said, “Twenty three degrees Celsius.” Drivers will be able to remotely control the car’s features via voice commands. The face-lifted Tucson SUV also adopts a server-type voice recognition technology, such as Kakao I as well as Apple’s CarPlay, Google’s Android Auto, and MirrorLink, enhancing accuracy and convenience when using in-car GPS systems. Drivers can continue moving toward an era, where vehicles can be used not only as a means of transportation but also as a place to enjoy leisure and hobbies.